Ding dong!! The Matsuri May Edition certainly felt like a festival. A festival of LIES!!! A lie of great proportion and wishful thinking was the one that got our Hopeless Liar busted and shamed. The Suspect stories were fascinating, funny, and totally unbelievable. We had the tale of the pregnant woman upsetting the nomads in the Iranian valleys, the over-zealous Tinder swiping that led to all his dates meeting each other, a successful self-study mission to learn the entire university collection of complex numbers to pass an exam, and the spy accusation from the Philippine Government during the post-Marcos regime. The Sleuthers shared their suspicions at the interval, with no one Suspect being the favourite. What would the interrogation bring? The interrogation was nothing short of fun. Every Suspect got an equal grilling, which showed that the Sleuthers in the audience had no idea. The front row gang from Milan used flash cards (genius!) and changed their liar choices every few questions. “Is -1 a complex number, Mishel?” asked the real-life Maths Professor visiting from Milan. The 2 minutes of conferring ensued, and votes were cast. Farnaz was voted the least likely to be lying with her silly pregnant woman and the runaway rams causing chaos. Ameya came in third with her photojournalism ‘spy’ tour of the Phillipines. Mishel was second most likely with his tale of being a maths genius and passing his university exam after 6 days of self-study. 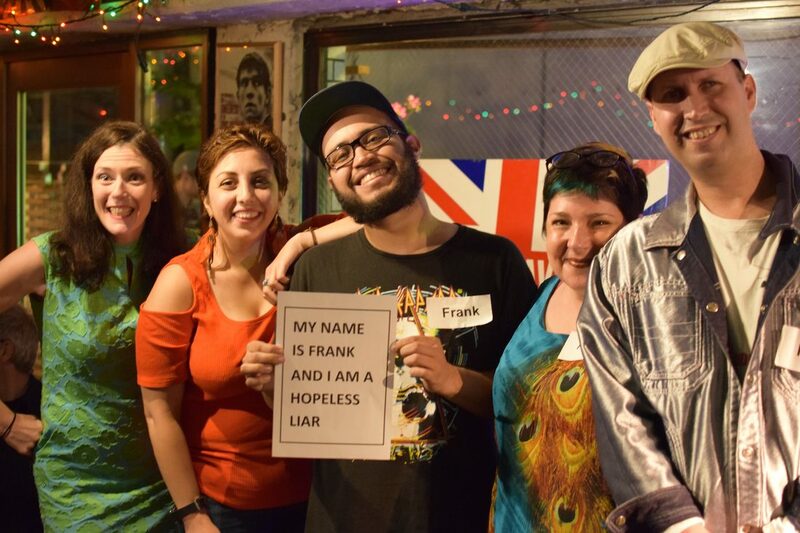 And finally, Frank only just had the highest number of votes with his shameful over-zealous use of Tinder being revealed in a room full of an unforgiving audience. The drum roll heightened the tension, the Suspects toyed with the Sleuthers and then…..BAM! 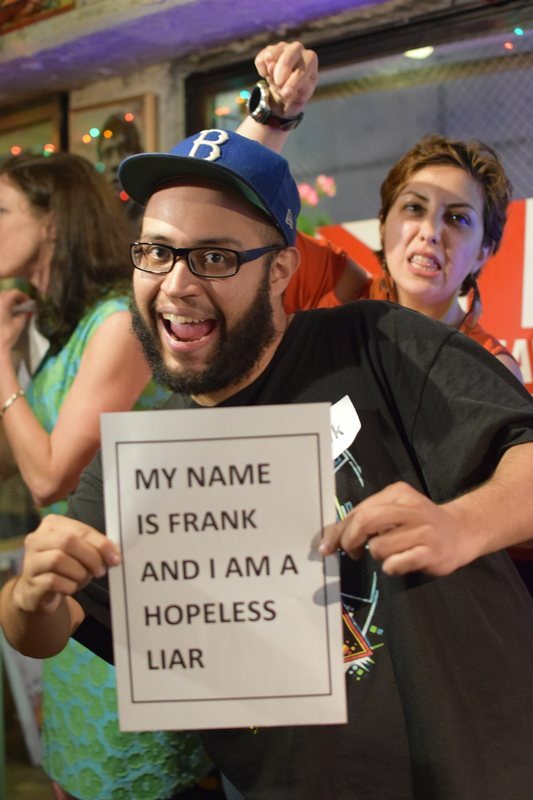 The Sleuthers erupted with cheers and groans as Frank stepped forward to claim his shameful title of Hopeless Liar. Let’s see if the tables will turn on the Sleuthers at the June Edition. Good luck! !